Measurement strand to your kindergarteners. The Coin Counting Book. By Rozanne Lanczack Williams. Illus. by author. 2001. 32p. Charlesbridge Pub. Inc.,(978-0881063264). Gr. K and up. This book has photographs of coins and rhymes about grouping and counting coins. There are some skills included in this book that are not included in the VA SOL (K.7-Money). I suggest reading this book in its entirety and then coming back and focusing on pennies and nickels. Telling Time with Big Mamma Cat. By Dan Harper. Illus. by Barry Moser & Cara Moser. 1998. 36p. HMH Books, (978-0152017385). Preschool and up. Following Big Mama Cat throughout her day helps students to understand the importance of time. There is a fold-out clock in the front of the book with moveable hands. This book is an effective introduction to telling time on an analog clock. Length (Math Counts). By Henry Arthur Pluckrose. Illus. by author. 1995. 32p. Children's Press, (978-0516454536). Gr. K and up. 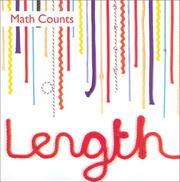 This book teaches children nonstandard ways to measure length. There are books suggested to go along with this book to teach children measurement of capacity and weight.